Our STUFF THE BUS Food Drive was magnificent. ROC Ambassadors were motivated to partner with this community service project when they learned Bakersfield has the highest hunger rate in the nation. 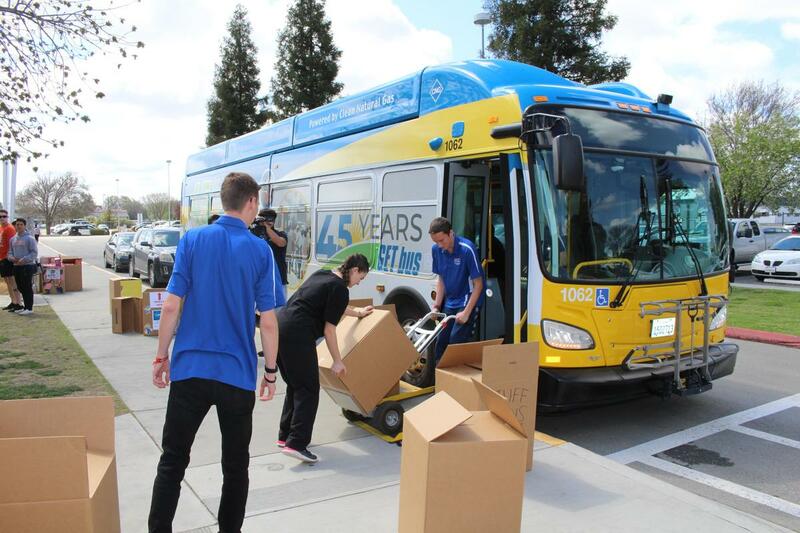 Our students donated over 6,000 food items for the needy in Bakersfield. Three programs topped 1,000. CAPK was amazed and appreciative for the outpour of support from ROC. It was a team effort, with teachers encouraging their students. Erin Briscoe from the District office captured photos as ROC Fire Tech students assisted packing boxes into the Career Center. CAPK workers then arrived at noon with a GET BUS and the fun began as ROC Ambassadors began stuffing the bus. Video Production cameras were rolling as ROC Fire Tech and ROC Law Enforcement students drove up with even more food items. ROC Intro to Health, decked out in their class shirts, came out to support as well. It was an awesome event! Shout out to Mr. Little and the Ambassadors!